Many people ask me the question, “How do I go about buying a new or used piano?” The answer to this question varies because there is no one right piano for every person. Over the years I have tried to educate people about the different kinds of pianos. The piano is probably the one consumer product that people know the least about; how it works, what materials are used to make it, what constitutes a good tone, which pianos last the longest, the list is endless. Through all of this, there are some guidelines for shoppers who want to find a piano that best meets their needs. 1.) The first thing I tell people about pianos is you can get a great Wurlitzer and a lousy Steinway! Pianos vary tremendously from individual piano to piano because they are made of a living substance – wood. This is why I avoid buying pianos on the Internet. You really need to play the piano you are buying or have someone you trust help you to pick one out. 2.) New and used pianos are different because the methods used to manufacture pianos have changed over the years. As a piano technician and restorer of pianos, I know that a good quality used piano has a place in today’s world because some of the best pianos were made as many as 100 years ago! 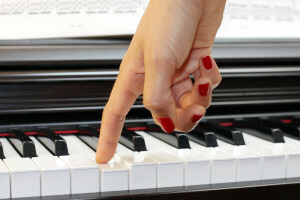 Conversely, many new pianos have advantages over their older counterparts because of advances in design and technology. The choice is often subjective because new pianos look, sound, and feel different from older pianos. Some people simply prefer a more contemporary style cabinet with a glossy finish. 3.) In pianos, size matters! Although a high quality small piano will often out perform a larger, less-expensive piano, the general rule is get the biggest instrument you can afford and which is appropriate to the size room it will be going into. This is because the soundboard of the piano is like a loud speaker (that is in fact what it is). You get more bass from an 18” speaker than you do from a 12” speaker. Likewise, you’ll get a fuller, richer tone from a piano with longer strings and a larger soundboard. While an upright piano (also called a vertical or stand-up) is a good choice if you don’t have space for a grand piano, the grand piano has many advantages which make it the best choice of the two. A grand piano outperforms an upright because it has an “action” which allows the player to repeat notes faster than on an upright. The sound projects better because the top is open and everyone loves the aesthetic beauty of the grand piano cabinet. It simply does more than any upright. 5.) What about piano warranties? With pianos, some of the finest instruments carry the shortest warranties. This is because a cheap piano made with plywood and pressboard will last a long time, but so what! A finely made piano, on the other hand, is a sensitive instrument and will lose its tone quickly if not properly cared for. 6.) Finally, if you are buying your piano from a retail piano store, try to find one where the owner is also a piano technician. You can usually trust someone who works on pianos themselves. Another advantage is you’ll get better service from a store who’s owner knows the business from that side. The warranty is only as good as the person servicing it. I hope these thoughts prove helpful in your search for the perfect new or used piano!